Some guides specifically choose to work as healers of body, mind, heart and spirit. Many will work with us to achieve vibrant health and vitality. Others will help us heal our minds or weary hearts. Some actually work on altering the chemistry of our bodies in subtle ways so that we can better attune to the spiritual realms. 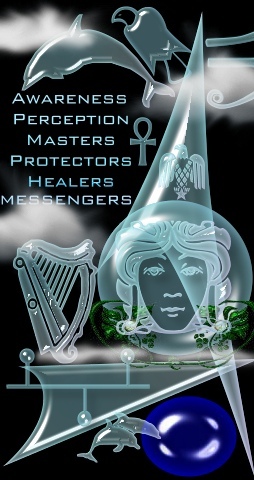 Another role of the healer guide is to help those of us who are called to become healers. They work with us to help us hone our abilities to diagnosis, support and infuse energy for healing as well as afford dexterity and skill to perform healing tasks. Animal totems or spirit animals will often appear to people who need healing. If this is you, you can keep alert and watch for animal guide signs. Notice which animals pop into your mind, or appear in the media or even in real life. Look for patterns and repetitive appearances. When you have identified the current animals around you, meditate on them and ask them what their lesson for your healing is. For instance, if a deer appears to you, she may teach you to be alert yet innocent - to cause no harm to any other living thing, even in thought. All too often, our illnesses are perpetuated by negative thoughts and emotions that become encrusted in our spiritual layers. Clearing is necessary - clearing of body, mind, heart and spirit to rid yourself of these burdens. Likewise, our angelic or shamanic guides can also help us to heal - to find the root cause of our symptoms, and how to deal with it. "Ministering angels" is a term with great meaning when it comes to healing. Let yourself rest in the glow and tenderness of your angelic guide's grace and love. Sickness and mental anguish can be healed by the mere presence of this true unconditional regard. Rest and have faith, see yourself whole and dynamic.